Successfully Added HK Warehouse Blackview P2 Lite Android Phone - 3GB RAM, Octa Core CPU, Android 7.0, 4G, 13MP Camera, Fingerprint Scan (Blue) to your Shopping Cart. With it humongous 6000mmAh battery, an Octa-core CPU, and 3GB RAM the Blackview P2 Lite is really set to impress. This cheap phone has a full metal body and features 2.5D arc glass on the front which gives it a high-end finish that is more accustom to flagship phones. The quality and finish of the P2 Lite are very impressive but when we examine the specs you'll be even more surprised, especially given the cheap price. A large 5.5-inch screen brings full HD 1080P resolutions and it's high pixel density ensures a sharp clear image. This will make movies, games and surfing the web all the more enjoyable. The hardware lineup includes an Octa Core CPU, 3GB of RAM and a Mali T720 GPU. This rightfully impresses as the Blackview P2 Lite will easily handle heavy multitasking or graphic rich games without missing a beat. The P2 Lite has 32GB of internal memory and for additional storage, you can add a micro SD card. So running out of space for apps, movies or photos is highly unlikely. With the large 6000mAh battery to draw on, you'll be able to enjoy days of typical usage from a single charge. Even the most dedicated Android gamer will find it hard to run through the battery in just one day. Having OTG on this phone will let you use that extra power to top up your other electronic devices. This is a real help when you're away from the mains for any length of time. This cool feature allows the P2 Lite smartphone to double as a power bank and can keep you connected for days on end. This Blackview Smartphone offers 4G connectivity so you'll get the fastest cellular internet speeds around and can even stream HD content without any problems. As you have dual SIM slots on this phone you can even manage two different numbers at once making it easy to organize your work and personal life from the one device. Other features of this spectacular smartphone are a 13MP rear camera and a super fast fingerprint scanner. 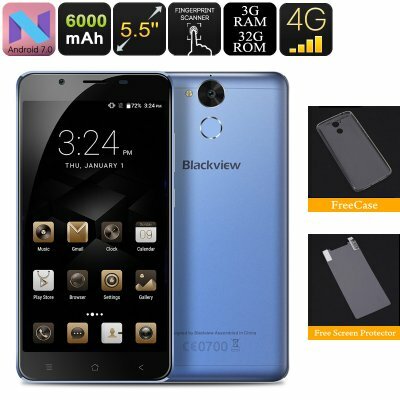 The Blackview P2 Lite smartphone comes with 12 months warranty, brought to you by the leader in electronic devices as well as wholesale android phones and cell phone accessories..